Home Game News Download PES 2013 Demo Today and Watch the Trailer Here! Konami have released a highly anticipated demo for PES 2013 today, available both on Xbox 360 consoles as well as PCs, with the PlayStation 3 demo being scheduled for release on July 31st. And in order to celebrate the launch of the demo – which should be definitely considered a must download by everybody, the developers have also launched a new trailer featuring Cristiano Ronaldo. 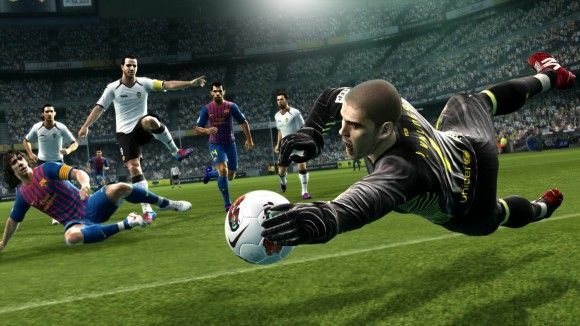 PES 2013 marks major advancements for the popular soccer game including new game mechanics such as PES FullControl, where players are given total control over every pass, shot and even first touch to the ball. Similarly, Pro-Active AI ensures that players move as they should both on and off the ball, creating a true authentic soccer experience. The Player ID system then enhances the feeling of individuality, with players that not only look and move like their real life counterparts, but also play just like them. The first demo allows users to experience these key additions first hand and features eight fully licensed teams, including Germany, England, Portugal and Italy from the European field, while Santos FC, SC International, Fluminense and Flamengo are available in the are available in the Copa Libertadores mode. The full version of Pro Evolution Soccer will hit game stores this fall.